Every house is different. 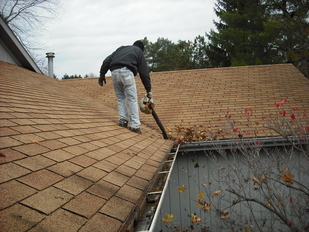 That's why we can't talk just about one way to clean gutters, because of that we have different Technics to do it, and those can be than from the floor, the roof or a latter. 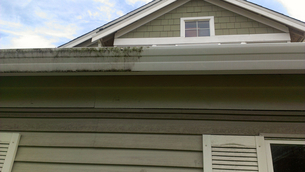 So what are the ugly black streaks, on the outside of gutters? 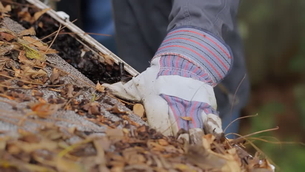 Most people think its mold and mildew from the moisture that accumulates on gutters. While some of it may indeed be mold, most of the time it’s not. There are two causes. 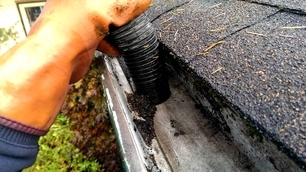 The first cause is the tar and asphalt from the roofing shingles electro-statically bonding to the outside of the gutter. Second, pollution and dirt build up on the top lip of the gutter. 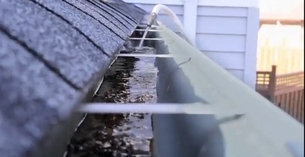 When moisture combines with these pollutants, it streams down the face of the gutter. Future precipitation will continuously follow the same path. Over time, the build up becomes alternating light and dark stripes. Regardless, this is a real tough stain, so unlike mold and mildew traditional low pressure chemical washing will not remove this stripes from gutters.